Austerity is Global – so is our resistance. Details: Monday, May 12th, 6pm at Kingston Public Library Central Branch (130 Johnson St), Delahaye Room. Here in Ontario, we also face major attacks. 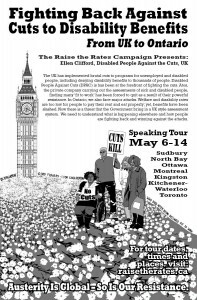 Ontario Works (Welfare) and ODSP (Disability) rates are too low to enable people to pay their rent and eat properly. The Special Diet and Community Start Up have been slashed by the Ontario Liberal government. Under huge pressure from ongoing community action, the Liberals have promised not to merge OW and ODSP but the danger remains that they will bring in a UK style assessment system that would pose a huge threat to disabled people on ODSP. We need to understand what is happening elsewhere and how people are fighting back and winning against the attacks. This entry was posted in Uncategorized on April 11, 2014 by Ontario Coalition Against Poverty.